After 31 years, 1,600 nights in a tent and a half million miles of on-the-job driving, Research Forester Tom Malone is calling it quits. Well, not exactly. Malone is such a dedicated University of Alaska Fairbanks employee that he will complete a few projects even beyond his April 30 retirement date. Malone, who grew up in upstate New York, always knew he wanted to be a forester. "I was an outside guy," he said. "But I didn't see a big future in New York and I wanted adventure." After earning a technical forestry degree at the Ranger School which is part of Syracuse University, he headed to Anchorage in 1978. 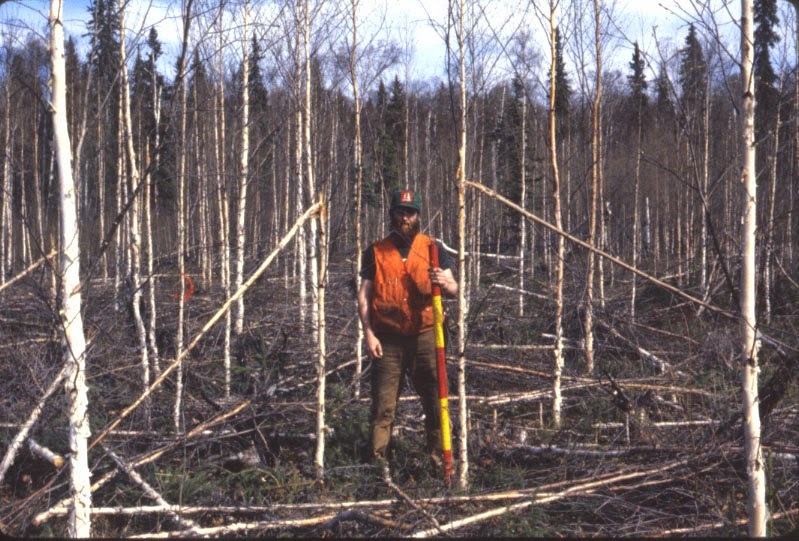 By 1982 his Forest Service job brought him to Fairbanks and the next year he went to work for UAF, as part of a logging crew conducting a thinning project and doing time and motion studies on equipment. In 1989 he started working with the Forest Growth and Yield Program and he's been there ever since. "We provide information to landowners and managers so they can make better land management decisions," Malone said. In 1983 Ed Packee, forest sciences professor, surveyed land managers to determine what management tools they needed. Then the FG&Y crew started collecting data to develop volume equations, site productivity curves and forest yield tables. The program's staff developed a set of permanent sample plots in interior and southcentral Alaska from the southern slope of the Brooks Range to Ninilchik, gathering a variety of data, from forest health and growth to ecology and soils. "It's the largest data set of this kind in Alaska," Malone said. Malone monitored 603 sites in a research area the size of Michigan and Ohio combined, alongside summer workers, student interns and volunteers. Each field season he had from three to nine people on his crew, working eight days on, six days off. Not only did he hire and train these young people, he and his wife Karen housed a lot of them in cabins on their property. "We hosted our 43rd international forestry student last summer," he said. The job requires carefully obtaining, recording and storing data. "Before starting a research project, one of the key things you have to do is determine that the data collected will answer the research question A statistician is the best person to help with that part of the project," Malone said. This position also requires people skills, as Malone coordinated his efforts with 23 agencies and private entities and had to be a good manager and get along with his field crews. "I've never met a kinder, more honest or more ethical person than Tom," said Steve Sparrow, interim dean and director. "He wouldn't even allow us to hold his retirement party during work hours because he felt it a misuse of public employees' time. Tom has worked with lots of students and researchers over the years, and I think he is held in high regard by all of them. "One characteristic I really like in Tom is that although he has done some really great work, he does not sing his own praises, but really enjoys seeing those he has worked with, trained or taught go on to do well," Sparrow said. Malone has loved working for UAF. "I was lucky to get this job," he said. "It's been a wonderful career but it's time for someone else to take over." What he will remember the most is the people. "Most were very nice and were good workers." The weather and mosquitoes are memorable too, as is the fact that with all those road trips and remote field days, nobody died or was seriously injured. "We talked a lot about safety and I never had to call a Medevac." 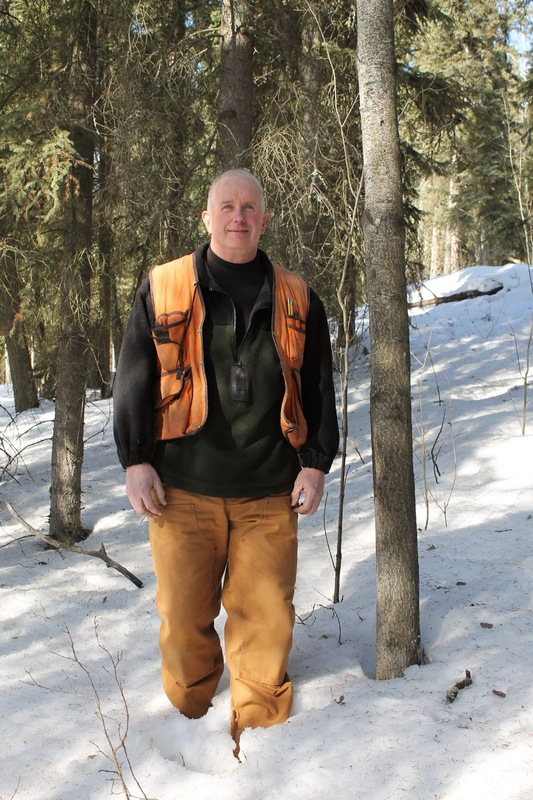 While working at UAF, Malone earned a bachelor of science degree in natural resources management (forest sciences option) and a master of science in natural resources management. His retirement plans are to fish more often, stay active and travel in the winter with his wife. He'll continue some of his forestry projects as a volunteer, including a week on Afognak Island this summer and a Youth Conservation Corps project at Susitna Valley High School. He is active in his church and the Knights of Columbus and enjoys refurbishing old cars. "It's been a great job," Malone said. "I got to do exciting things, travel Alaska and meet super people." Professor Glenn Juday said, "Tom has been particularly responsive to our efforts to archive his many plots and studies into the Boreal Alaska -- Learning, Adaptation and Production archive of Data Atlas of Forest Research Installations. He has organized the data beautifully and has all the data sets in good shape. It's a model of handing on a long-term study." Malone's long-time colleague, Alan Tonne, manager of the Fairbanks Experiment Farm, said, "If you were to look up Forest Growth and Yield Program it would or should say Tom Malone. He's been so much a part of that program that it won't be the same without him, but it will carry on." Congratulations on your retirement, Tom!! This post is a thoughtful tribute to a hardworking and wonderful person. I was fortunate enough to be part of Tom's summer field crew for two seasons. I know that he will be greatly missed and I hope that his legacy is cared for and maintained to high standard. UAF, forest owners and stakeholders, and really all of Alaska's residents, have been extremely fortunate to have Tom on the job.